I’m long overdue for a new pair of glasses. The last time I got a pair of glasses was almost 7 years ago haha. I also knew that if I were to get glasses, I wanted something fun but still classy (so that it is work appropriate). That’s when I came across Firmoo. They have a large selection of different styles & frames. Sometimes buying glasses online is tricky because you can’t physically try it on. Luckily, Firmoo has a ‘Virtual Look Viewer’ feature. Basically, you select your face shape and an avatar of that face shape appears wearing all the different pairs of glasses. This was so helpful because I can visualize how the frame will look on my face. My other favorite feature is how affordable and easy it was to order. My frames are currently on sale for $19. Yes, $19! After selecting my frames, I just provided my prescription information. It even gives a description of what they’re asking for in cause you’re unsure. Firmoo also offers first pair free for new customers only. Get all the details here. They strongly believe in giving everyone an opportunity to correct any of their visual problems. They want to make it affordable for all income ranges. If you’re not 100% satisfied, they will provide a FULL refund. Gli occhiali mi piacciono molto, le scarpe sono super! These glasses look great on you!! I was the same way, it had been an embarrassingly long amount of time before I got some new glasses! Thank Alecia!! Haha glad to hear I was not the only! Thanks Vanessa! 🙂 Haha that is awesome! Super cute glasses and they look fabulous on you! Love the scallop pumps too 🙂 Happy Wednesday! Thanks Melody! Thanks for stopping by! You look ridiculously adorable in these glasses, Rach! Love the heels too! You look beautiful in those glasses! I also love love love your scarf and heels! What a lovely spring outfit! 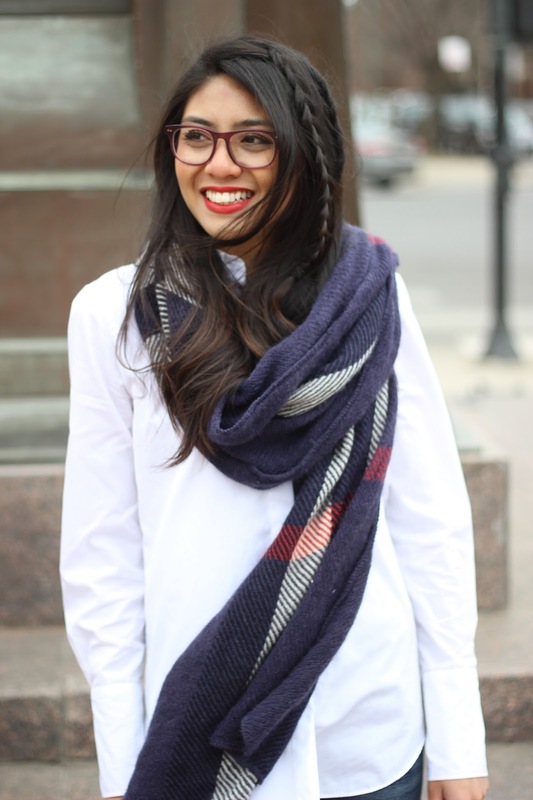 I love this classic look…the scarf is so pretty! Those glasses look great on you! I like that they have a virtual viewer so you can see what you look like before ordering. Thanks Jess! I love the virtual viewer. It was so helpful! This scallop edge is AMAZING!! Your braids look super cute also! Isn't Firmoo the best?! You look so great in your glasses. Loving those heels. Love your hair.Beautiful, casual look! Those heels are beautiful! Great look! I love this look! 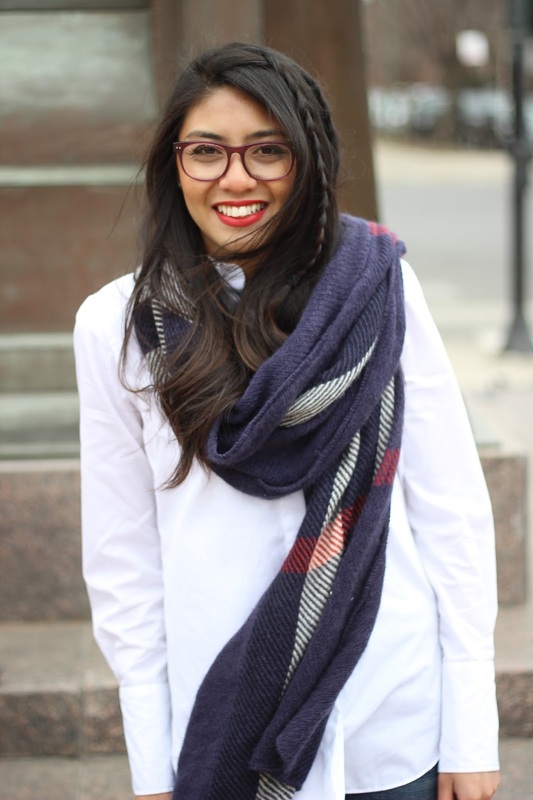 That scarf is so cute, and your new glasses are awesome! I want to learn how to braid my hair like that! I know this post is about the glasses (which are so cute on you – need to try!) but I love love love your heels! Aren't they great eyewear company?! Thanks Kiki, it is one of my fav purchase haha. LOVE that scarf and your entire outfit babe! Great look, babe! I am swooning over these grey heels! Love the scalloped edges on them!